Hanami—the act of cherry blossom viewing—is an extremely popular activity in Japan that both locals and tourists enjoy during cherry blossom season every year. For a short week or two every year, sakura trees blossom and Japan is transformed into a visually arresting sea of pink. Cherry blossoms usually come hand in hand with the beautiful historical sites of Japan. 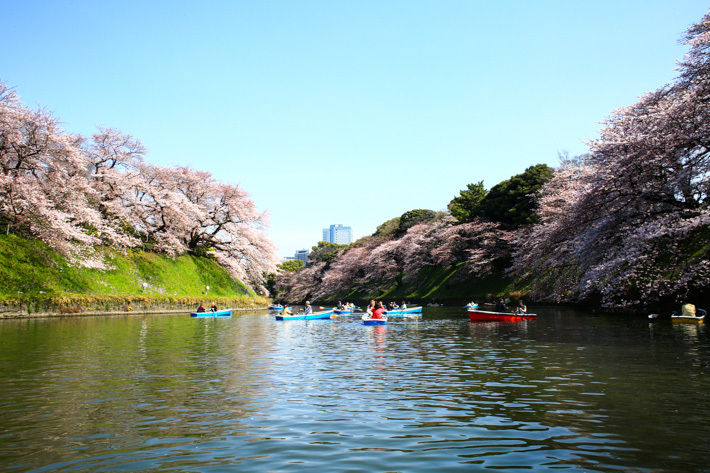 You can enjoy hanami at historical sites such as shrines and memorials or in one of Japan’s many parks. Take a stroll in the parks, or have a picnic under one of the many sakura trees; spring in Japan is an extremely wonderful time. It is worth the travel to Japan just to experience this annual event. Today, we share the Cherry Blossom Forecast for 2018 and where you can view them at 10 of the most popular cities and spots in Japan. The annual Cherry Blossoms at Gardens by The Bay’s Flower Dome is back from now until 24 March 2017. This year, there will be more trees spread out around the conservatory, as well as new varieties that will be on show for the first time. Cherry Blossoms in Japan are a phenomenal sight. It is the kind of moments that will stay forever etched in your hearts and minds, and it will make you crave for more. ‘Hanami’ is the activity of cherry blossoms viewing, and it happens annually in Japan. The full bloom periods differ from city to city, but the average bloom period is one week and slightly more, if you are lucky. Visitors from all over the world plan the trips way in advance based on forecasts, in hopes to catch a glimpse of Japan’s prettiest flowers in its full bloom. And if you are thinking that just seeing the flowers alone doesn’t sound all too exciting, you are very wrong. From rowing a boat in the parks to indulging in cherry blossoms delicacies, Here’s Why You Should Visit Japan During Cherry Blossoms Period. It is an experience that you will never forget. Mid-April is a wonderful time to visit Seoul for the annual Yeouido Spring Flower Festival. This is when the 1,600 cherry blossom trees that line Yeouiseo-ro Road will be in full bloom and you get to witness the spectrum of pinks and whites.It is a sight you will never forget. It is a sight you will never forget. Hanami in Japan, or Cherry Blossom viewing, is one that we look forward to every year; and we believe it is the same for you. During that short couple of weeks, one of the world’s most coveted flower displays awaits—the blooming of Japan’s spellbindingly beautiful Sakura. They happen all around Japan at different periods of time, and that means hanami in several different cities and places. Sakura is synonymous with Japan, and if you haven’t experienced hanami, you are missing out in life. Nothing feels quite as ethereal as marvelling at the beauty of these stunning flowers. Each blossoming period lasts for an average of two weeks, and the cherry blossoms look best on the final week of blooming, where they are at their fullest. Every year, many flock to Japan just for hanami, and you might want to plan and book your trip early to avoid disappointment. Here, we share with you the Forecast for Cherry Blossoms in Japan 2017—Where & When To See Them.